This is my entry into the Blackthornprod Game Jam (2nd edition), a 3D Survival Sandbox/Wave Game hybrid. Your goal is to survive for as long as possible, and beware of the falling cubes that deplete the world around you. The game is permadeath, and will need to be restarted if you want to play it again. NOTE: On windows you may need to run as administrator. Controls are explained within the help screen of the game. C++ - language used to build the engine. OpenGL - allows the drawing of graphics on the GPU, rather than the CPU. Base code - some base code I pieced together on Friday the 22nd that I coded in other projects; basically saved me about 6-7 hours of coding mesh, shader, texture, renderer, entity, and other classes that don't have much to do with the game, just the engine. I can't wait to find out what I forgot to implement! you claim the game runs on linux, but there are no linux binaries. Try running as admin. If that doesn't work, then make sure the .dlls and the .exe are in the same directory. Okay, admin did not help, but after a bit of trying and failing it works. 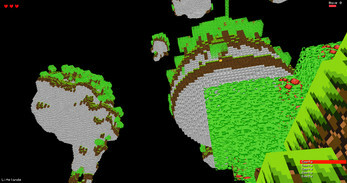 It seems it crashes ~80% of the times it tries to generate the world. Overall the game isn't that origional and there isn't very much in terms of gameplay eighter that haven't already been seen in other games. though the technical feat is quite astounding. Building any game from complete scratch is very inpressive and that fact that you did that in a week is quite inpresive. So as far as gameplay, visuals and sound there isn't too intresting, though i can see that a lot of work as gone into this, and it is really inpressive that you managed to build this with only the tools that you used. If your'e intrested you could check out my game, i haven't been very lucky with the ammount of ratings either. Very ambitious project! You definitely accomplished a lot more than I would have been able to with this idea. However, it's not very original. As well, there doesn't seem to be much to do in the game. I would expect it to focus on exploration but there weren't many interesting things to find. It's difficult and time consuming to reach other islands, and there isn't much point to doing that in the first place. There was an annoying bug where after I died, pressing play would only bring me to the "you died" screen again. Still, ou did a surprising ammount with the limited tools you used. Also, (not really a complaint) opening this game gives me a warning that it could be dangerous. I'm not sure if there's a way for you to fix that.